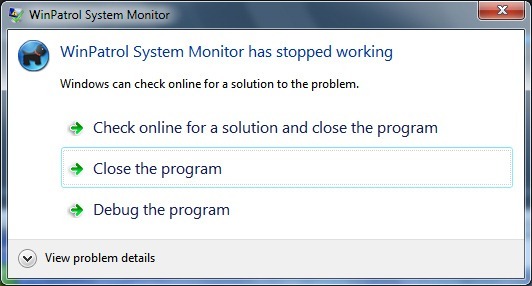 I have suddenly received a number of reports that WinPatrol is crashing after new alerts are displayed. As soon as you try and respond Yes or No, the WinPatrol monitor dies. If you have experienced a crash or screen like I’ve displayed below I have an immediate fix you’ll want to know about. You can use the solution provided here and watch for a new version which should be available by tomorrow.. It appears this new error could be related to recent updates of either Windows, Java or Flash. Ironically, it started to happen right after I wrote a critical article about updates adding the Ask Toolbar and/or McAfee Security Scan but I would hate to think it's related. The only reason I installed both Java and Flash was to capture screen shots for my blog article. The most likely cause of this problem is something included in the recent Windows Update. I hope to isolate the problem so I can report it to Microsoft. Unfortunately, my first priority is to respond to all the Email from WinPatrol customers. I have duplicated this behavior and I have already have created a version that works. I had hoped to include more features in the new version but instead I will be testing it today and it will be available as soon as I'm comfortable. I have found that downloading the WinPatrol Enterprise Edition will fix this bug. This version 26.5.2013 is available at http://www.winpatrol.com/download.html and can be used by both Free and PLUS users. You don’t have to subscribe to WinPatrol Enterprise. The other easy solution if you really miss having Scotty on patrol seems to be removing the check box on the Options tab that says, “Share real-time cloud choices”. I haven’t fully tested this but it is something related to code which happens immediately after you make a choice on the Alert screen. What WinPatrol keeps in our cloud is the decision you make on keeping or removing a program. We collect these choices and make the totals available to WinPatrol PLUS members. This feature helps you make a decision based on the choices of other WinPatrol users. After we fix this bug I hope you’ll recheck this option and participate so WinPatrol users can continue to help each other. If you notice problems this week with other programs I would be interested. For instance, my laptop is now failing to play sound and I get a message about my sound driver. While I can fix the WinPatrol bug I’m anxious to know why it suddenly occurred and which Windows Update resulted in this change. If you see anyone post about this problem in a forum feel free to let them know about this solution. Testing the new version will take priority over my participation in forums or responding to most Emails today. I am confident that I will have a new fully tested build by the end of the day. Another bit of irony, one of the new features planned for the newest release is a way to notify users when a new version is available. That feature has been tested and will be included in the new version. Over the past year a custom version of WinPatrol has been quietly available to a handful of companies that requested a little extra support for features they needed. These features required some custom programming, support and server activity so in the past they weren’t available to all WinPatrol PLUS members. Due to popular demand I have standardized these features and developed an easy to use, secure interface. These features are now available to other business customers and perhaps even families with multiple computers. Even if you don’t need the subscription to WinPatrol Enterprise, the newest version(26.5.2013) is still available with a few bug fixes to current FREE & PLUS users http://www.winpatrol.com/download.html. The main focus of WinPatrol Enterprise is to have a single WinPatrol Administrator keep watch over changes made to systems used by individual employees or family members. When a change is detected an Email will be sent to the WinPatrol Administrator. The Email will include date/time, unique ID, type of change, full filename and other useful information. The Enterprise service requires regular maintenance so this feature is available on a subscription basis. The cost will be minimal and each subscription may be installed on up to five machines. Each of these machines can assign a designated WinPatrol Administrator who will be notified of any alerts and/or changes made by an employee or family member. In addition to notifications we’ve enhanced the ability to hide alerts so a user won’t have their work interrupted. Alerts can be disabled and the WinPatrol Administrator can define the default action that will take place without user input or confusion. On the same screen it’s possible to disable the WinPatrol system tray icon so many users won’t even know WinPatrol exists. The WinPatrol Administrator will be needed only in extreme cases. This procedure is not meant to be a way to spy on employees. 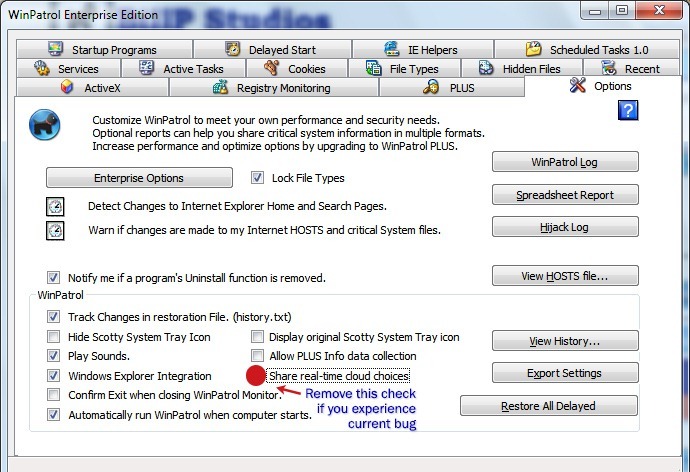 Anyone who has WinPatrol Enterprise installed on their computer must be notified. At this time, an administrator may not make changes without logging into the machine which has WinPatrol Enterprise installed. If these features were built in WinPatrol Enterprise it could be abused and I feel it’s important that WinPatrol could not be used by stalkers. If you wonder why I’m against blind monitoring just visit my friends at the National Network to End Domestic Violence. Alternate formats are currently being developed. This has worked in the past for our business customers but I’m open to suggestions of other useful data. 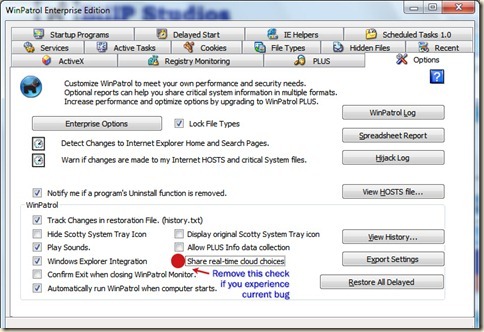 Click to Download WinPatrol Enterprise Edition. The biggest threat to your security may be the answers you’ve given to security questions. You could have the wackiest combination of characters in your password but it won't matter when someone can easily find out what high school you attended. If you’ve been paying attention to computer news you may have heard that the US Federal Reserve Bank was hacked. Details on over 400 bankers was stolen although the Fed won’t say what the “Details” are. You may have also heard about the Bush family being one of the many hacked due to a flaw in Yahoo’s Email service. One flaw they have in common is an outdated method to reset your password. This week I discovered one reason banks have failed to provide accurate security all the way up to the top. It took me 3 minutes to find that Fed Chairman Ben Bernanke’s mother’s maiden name was “Friedman”. I recently realized the company providing services to my small town bank is still living in the 70’s and probably still stores my information on magnetic tape reels programmed in COBOL According to its website Fidelity National Information Services or FIS is the world’s largest global provider dedicated to banking and payment technologies. I’m a big fan of security questions but not when multiple sites use the same questions. It’s especially scary when I see what must be the first security question ever used. Mothers Maiden Names? Even if you can’t remember multiple passwords what I recommend is creating standard replies for common security questions. Since most answers to security questions can be found on Facebook your answers to security questions should never be truthful. What’s your favorite book? Your answer should not be The Bible, The Hobbit or 50 Shades of Grey. It won’t be hard to remember, “Jokes for the John” or “Green Eggs and Ham”. Just associate your answer with a common theme. Where did you go to High School? NEVER give your real school. The kids on Happy Days went to Jefferson High. Use your own imagination and make up a high school name you’ll remember. Where were you born? How about Taxicab or Seattle Grace? The name of your first pet? How about Dino? Even if your dog had a different name, don’t use Snoopy or Lassie as fake answers. They’re like using 12345 as a password. Now that I’ve used these examples I wouldn’t use any of them but you’ll find it’s easy and fun to come up with fake answers. Create fun fake answers that are so funny, you’ll be sure to remember them. And if they ask you for your mothers maiden name, go complain to your bank manager like I plan on do. While I can’t say the recent Federal Reserve attack was due to a common security question the screen shot from my bank is real. The number of hacks that begin with a simple security question is undeniable. As a security professional I’m embarrassed it took this long for me to write about this problem. Just ask Sarah Palin what high school she went to and you’ll be reminded this problem has been around for many years. Most companies do little to notify customers and have a policy to reduce the severity perception of any attack. The common response is “No indication of customer data being abused has been reported”. In severe cases a company may offer free credit report monitoring for a year to their customers. Unfortunately, this typically requires you to sign up using a credit card and unless you remember to cancel you’ll automatically be renewed and charged for any future years. Immediately try to sign on Twitter and change your password. If your account was compromised Twitter may have already changed your password and you won’t be able to sign on. Don’t keep trying to sign on or you may be blocked. Even if you weren’t a victim, tell Twitter to send you a password reset link to your associated Email address. Check your Email and create a new password that you’ll remember and is different than your current password. Important: If you used your Twitter password or even something similar on other services like Facebook, start going to all the other services you use and change your password. I know keeping track of passwords is hard but hackers know you share passwords. The bad guys have automated tools which are now trying to use your Twitter Email and password to access Facebook, Google+, Gmail, Pinterest, Microsoft Live, LinkedIn, Instagram, WordPress, BlogSpot and even GoDaddy. When you reset your password be sure to verify all the email accounts and cell phone numbers which are associated with your account. A hacker will add contact information so they’ll be able to re-reset your password and no matter how many times you change your password, they’ll still have it. Just in case: Your Twitter account is associated with an Email address. Change the password on this Email account. While the attack will not expose your email password it may make the email known. Depending on your background you could become the target of future attacks and that email may be the key to many other desired accounts. Be Smart: Be wary of ALL messages you receive from your friends especially on Twitter but also on Facebook, Email and other online services. If your friend had their account stolen they’ll most likely be sending out phishing attempts or links that will infect you. If you receive anything suspicious notify your friend immediately by phone and share these tips. See https://twitter.com/settings/applications to view your apps and clean up any unwanted application. Remember to change the password on other Twitter accounts you have. In my case, one of my Twitter accounts was compromised but others were not. While my BillP account was compromised, I was able to sign on to my WinPatrol Twitter account without being forced to change my password. Imagine if I had used the same password for both accounts. I’m pleased Twitter has made this attack public and even better they are forcing a password change. They risk losing customers but they risk a lot more if user accounts remained open. I received the following Email at 11:09 AM EST today letting me know of the attack even though the Twitter Blog reported the attack yesterday afternoon. It might be worth following @boblord, the Director of Information Security for Twitter or the official @Twitter company account. As a precautionary security measure, we have reset your Twitter account password. Check your inbox for a separate email from Twitter with instructions on how to reset your password. If you don't see an email, you can go to this page in our Help Center to request a password reset. More information is below. We recently detected an attack on our systems in which the attackers may have had access to limited user information - specifically, your username, email address and an encrypted/salted version of your password (not the actual letters and numbers in your password). Further information about the attack can be found in this blog post. Since your password has been reset, your old password will not work when you try to log into Twitter. We strongly encourage you to take this opportunity to select a strong password - at least 10 (but more is better) characters and a mixture of upper and lowercase letters, numbers, and symbols - that you are not using for any other accounts or sites. Using the same password for multiple online accounts significantly increases your odds of being compromised. For more information about making your Twitter and other Internet accounts more secure, read our Help Center documentation or the FTC's guide on passwords. This attack was not the work of amateurs, and we do not believe it was an isolated incident. The attackers were extremely sophisticated, and we believe other companies and organizations have also been recently similarly attacked. For that reason we felt that it was important to reset your password and publicize this attack while we still gather information. We are also helping government and federal law enforcement in their effort to find and prosecute these attackers to make the Internet safer for all users. So, please take this report seriously and do the homework I assigned above. As I’ve pointed out, the impact of this exposure goes far beyond Twitter. I hope you all realize the danger of you or your friends using the same passwords for multiple log-ins. Even though Twitter took drastic measures by forcing users to reset their password, many risks still exist due to this common behavior.